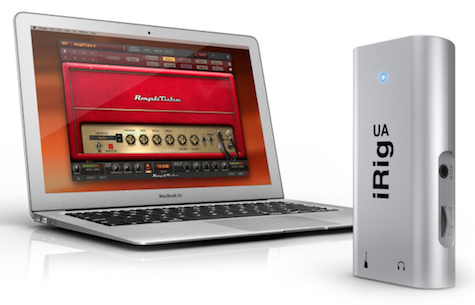 iRig UA by IK Multimedia is an audio interface that allows you to create real time effects from many Android devices. It is very similar to IK Multimedia’s iRig2, but the UA adds a built in digital signal processor (DSP) that expands its capabilities to become a digital recording interface. I recommend you read through the company’s dedicated web page for this product. This is truly a plug and play setup. The product comes with the device and a micro USB cable for your Android device. After downloading AmpliTube, the companion effects processor app, I was up and playing in minutes. There was a initial crash of the app. I blame the phone, but after that I was able immediately to mess around and try different amp, cabinet, and effects combinations. The AmpliTube app is very similar to the iOS version. It’s been a while since I looked at that version but it all was familiar. Included with this app are nine effects, five amplifiers, five cabinets and two mic choices. 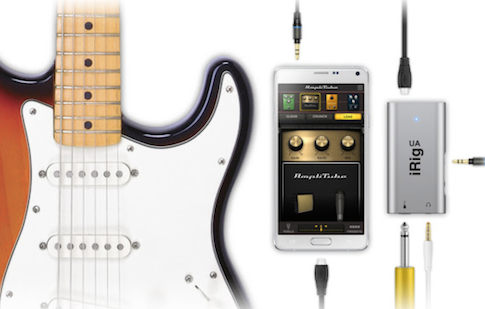 In-app purchases allow for more selections or branded combinations from Fender, Ampeg, and others. There’s two ways I like my bass playing to sound: smooth or dirty. The AmpliTube facilitates the former very well, and the latter not so much. I was able to create a well rounded, low end heavy sound that sits right in the back of a mix until you want it to pop out. When I want to get dirty I really like the chaos of analog processing. While you get throw in distortion, or overdrive the amps, the IK Multimedia system has a precision to my ears that just doesn’t do it for me. I’ll admit this is boiling down to a vinyl versus MP3 style debate but the heart wants what it wants. Sometimes and it can only find that with a crappy bass, amp, and a mic that has been through the trenches of touring for a few years. I was using a OnePlus One phone running Lollipop (Android 5.0) as my Android device for this review. AmpliTube works great on that version of Android, which is still the main flavor, so you should be fine. The issue that I had was I tried to download a few other apps to see how they would handle input from the UA. All of them crashed on this phone, which brings me to my only real complaint. This has been the on-going issue with Android for years: the apps just aren’t there in great numbers. This is a excellent piece of hardware that will benefit from a wide range of apps, but they just aren’t there. Since the UA has a built in DSP it can also be used as an audio interface with your Mac or PC. No extra software or drivers are needed. I used it with Logic Pro on my Macintosh with no issues, no latency, and a great clean sound. Given the portability and ease of the UA this makes for perfect sketch song writing. I think with enough tweaking and possibly some in-app purchasing I might put this in a recording or live situation, but I think that is more about my stubborn analog loving ways than anything to do with this device. MyMac Review Rating is 8 out of 10.